It feels like the majority of people are concerned about getting enough protein, yet could they explain what protein is, why they need it and how much is necessary? Maybe a select few could, but protein seems to be one of those topics people just repeat what they heard. If most people were asked to do a presentation on the topic, they’d likely throw their hands up in the air and make a mad dash for the exit. When it comes to a vegan diet, the first question, comment and concern is always about protein. How do vegans get protein? Food. Can vegans get enough protein? Of course. Protein deficiency, among vegans along with everyone else, is all but unheard of in the United States. Around the world, protein deficiency tends only to be seen in the context of overt and serious malnutrition and starvation. For starters protein is an essential macronutrient. Protein is made up of amino acids that are attached to one another in long chains. There are 20 different kinds of amino acids, and the sequence in which the different amino acids are arranged helps determine the role of that particular protein. Protein is found throughout the body—in muscle, bone, skin, hair, and nearly every other body part or tissue. It makes up the enzymes that power many chemical reactions and the hemoglobin that carries oxygen in your blood. At least 10,000 different proteins make you what you are and keep you that way. Our immune system requires protein to help make antibodies that are required to help fight infections, and protein also plays a role in blood sugar regulation, fat metabolism and energy function. Different organizations, nutritionists and dietitians vary on their recommendations of how much protein people need daily. The right amount of protein for any one individual depends on many factors, including their activity level, age, muscle mass, goals and overall health. With that said, here are some numbers to get an idea. The National Academy of Medicine recommends that adults get a minimum of 0.8 grams of protein for every kilogram of body weight per day, or just over 7 grams for every 20 pounds of body weight. For a 140-pound person, that means about 50 grams of protein each day. For a 200-pound person, that means about 70 grams of protein each day. The National Academy of Medicine also sets a wide range for acceptable protein intake anywhere from 10% to 35% of calories each day. The DRI (Dietary Reference Intake) is 0.8 grams of protein per kilogram of body weight, or 0.36 grams per pound. 56 grams per day for the average sedentary man and 46 grams per day for the average sedentary woman. Will protein make me lose weight? Wanting to lose weight is the reason behind why many people turn to protein-rich foods. Assuming you are making healthy food choices in addition to eating a lot of protein, yes it could help you lose weight. A high protein intake can also boost metabolism and reduce your appetite. I’ve been vegan for what feels like a lifetime and I personally do better with moderate to small amounts of protein. Whenever I increase my protein intake too much, I don’t feel right, my digestion is off and overall I can tell it’s not necessary. Guess I’m a natural born rabbit just following my calling. Not all plant-based proteins are created equal and some are not a complete protein. Most people don’t need every essential amino acid in every bite of food in every meal they eat; we only need a sufficient amount of each amino acid every day . 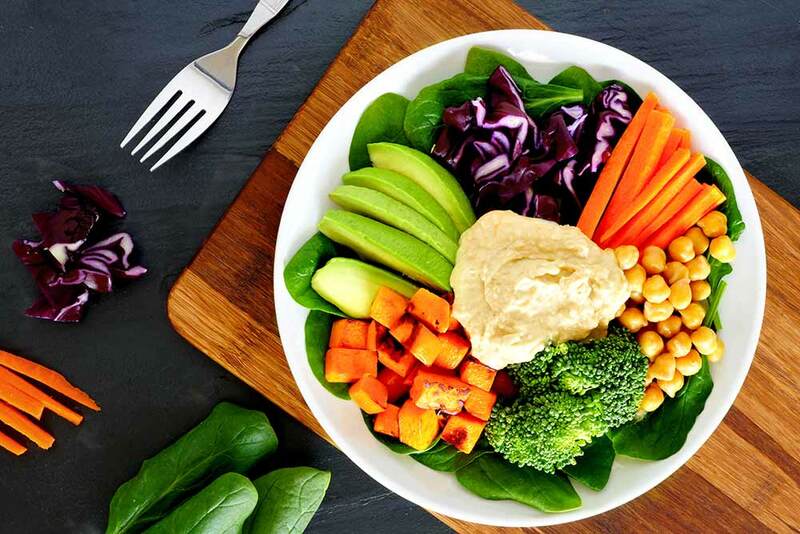 Most dietitians believe that plant-based diets contain such a wide variety of amino acid profiles that vegans are nearly guaranteed to get all of their amino acids with very little effort.